There are reasons that some people see miracles and others don't. It's not fate or luck. It's not like lightning, where you never know when it will strike. God doesn't pick and choose; there are principles we have to follow to see His power manifest. If you don't understand that, that's one of the reasons you're having problems. But you, too, can see the miraculous power of God. Some people have the mistaken belief that if they are really following God, then everything should be smooth sailing. That's how a lot of people discern whether they are in the will of God. They look at their circumstances, and if everything is just perfect, then it must be God. But thinking you have missed God just because you have a problem is absolutely incorrect. This instance proves that. They were doing exactly what the Lord told them to do. It is true that some storms are of our own making. Jonah proved that (Jonah 1-3). Jonah ran from God, encountered a storm while on a ship, was thrown overboard, and wound up in the belly of a fish. But these disciples were smack dab in the center of God's will when this storm hit in Matthew 14. I'm saying all this to point out that you can't look at circumstances to tell you whether you are in God's will. You need a word from God. You need an inner witness from the Holy Ghost that what you're doing is what God told you to do. If you don't have that, it will hinder you from seeing His power manifest in your life. When problems come, you'll feel condemned and think, I brought this on myself; I deserve it. You need to know, first of all, that you are doing what God told you to do. Most of these disciples were fishermen on that very lake. I personally believe that the reason Jesus had to constrain them to get into the boat was because they knew that the conditions were ripe for a storm, and they didn't want to be out on the water. But if they had been thinking about the fact that Jesus had just fed 5,000 people, not including women and children (Matt. 14:15-21), then they would have expected a miracle, because they were only out there at Jesus' direction. It wasn't their wisdom. They never would have done this if it were up to them. But in the center of God's will is where you can hope to see the miraculous! You see, Jesus was aware of their situation, and He was responsible for them being there. You might be in a situation right now where you are facing absolute disaster financially, physically, emotionally, or in your relationships. Maybe nothing seems to be working. If you are there because of your own rebellion and disobedience to God, then you need to do what Jonah did in the belly of the fish-repent (Jon. 2:1-9). You need to say from your heart, "God, forgive me. I know I've been in rebellion toward You, but right now I make a change to follow You again." Get out of rebellion and get to where you're submitting to God. He loves you and wants to set you free. So, are you a Peter or a Jonah? If you are in the midst of a storm and you know that you are there because you've been following God, then you need to recognize that the Lord is responsible for you. Where He guides, He also provides. That's just a principle of God. Just as Jesus was aware of these disciples' plight, He is aware of your situation. God is in the midst of the storm with you, and He's not there just as an observer. He cares for you more than you could possibly imagine. His power is present to set you free. Instead of expecting defeat, instead of meditating on tragedy, you need to expect a miracle from God. You've got to get away from doing everything in the natural and only depending upon God as a last resort. God ought to be your first resort. That's what my series on How to Become a Water Walker is all about. God has miracles He's wanting to manifest in your life. The story of Peter walking on the water is powerpacked with truths. Walk on top of your problems instead of being overcome by them. Likewise, many of us are afraid to step away from the world and out on the word that God has given us. We want the miraculous but don't want to leave the relative safety of what everyone else is doing. But just like this boat, the world is in crisis. Without the Lord, it's going to sink. Why are we so afraid to leave the mundane and trust God for a miracle? Peter was willing to risk it all. As long as you can live without the miraculous power of God, you will. But there should be something in you that is sick and tired of being sick and tired. God made each one of us for greatness, but not greatness by the world's definition; the Lord wants to release His miracle-working power in you. He wants to make your life better than your biggest dream. Someone might say, "But Peter began to sink." That's true. But Peter also walked on the water. That's something that no one but Jesus is recorded in Scripture as doing. And when Peter began to sink, the Lord was right there to pick him up. He didn't drown, and neither will you if you get out of the natural and begin to start walking in the supernatural. Some of you might think, Well, I don't need a miracle like this. I don't need to walk on water. What does this have to do with my situation? Of course, I'm not saying that God wants you to go physically walk on water. The significance of this is that here was a situation where it looked like the disciples might be killed and Peter was able to walk on top of what was trying to kill him. What's trying to kill you? Is it sickness? How about financial problems or marital problems? Maybe it's just the mundane. Many people are suffering from boredom. Whatever it is, God wants to release His miracle-working power in you and put you on top. But it's up to you. It's His power that performs the miraculous, but Peter didn't see that power in operation until he took a step outside of the boat. 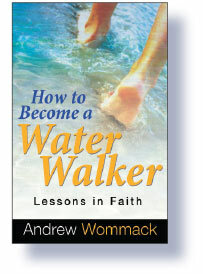 I have just put my teaching on Peter walking on the water into a brand-new book. You can get this teaching as a CD or DVD series as well as this paperback book. You need to get hold of these truths. I've seen these lessons in faith help countless people. You will be blessed.